I’ve always been one of those R.W.’s who likes to be active. I rarely sit still for long. Like most pre-video game, pre-smart-phone little girls, I spent a whole lot of time outside playing, or going for long walks, or biking, or even dancing in my room with my music cranked. I was not an athletic sports jock, although I am proud to say I was on the first-ever girl’s soccer team in my school during eighth grade. Team sports were not really my thing, but I found plenty of other ways to use my energy. Then in the late 80’s I discovered aerobics, and I was hooked. It didn’t matter what kind it was, dance, step, or water, I was all in. Whenever I wasn’t donning a leotard and headband, I was out hiking or biking. Over the years, throughout the process of time and age, I have slowed down – at least comparatively. I am nowhere near in the kind of shape I was in my youth. In those days, I had the drive and delusion that I could be as fit as Karen Voight. I’m sho wing my age with that name-drop, but trust me, 25 years ago she was my idol. I realize now she was one of those rare freaks of nature, but back then, her body and strength seemed attainable. Now I stay active mostly to fight back weight gain and the aches and pains of maturity. I could run five miles or swim ten laps about as easily now as I could fly to the moon by flapping my arms. It just isn’t going to happen. And I’ve grown to be ok with that. As long as I can still walk and bike, do some strength training, get out of bed without assistance, and not have under-arm waddle, I’m learning to be happy with my level of fitness. I try to do at least something active every day. When I travel, I scope out the nearest fitness center or walking route for my use. As the week progressed, I began to have a better appreciation for a more sedentary lifestyle. There is certainly something appealing about stretching out in a lounge chair, or sprawling across a sofa, a book in hand, or a nap to be had. 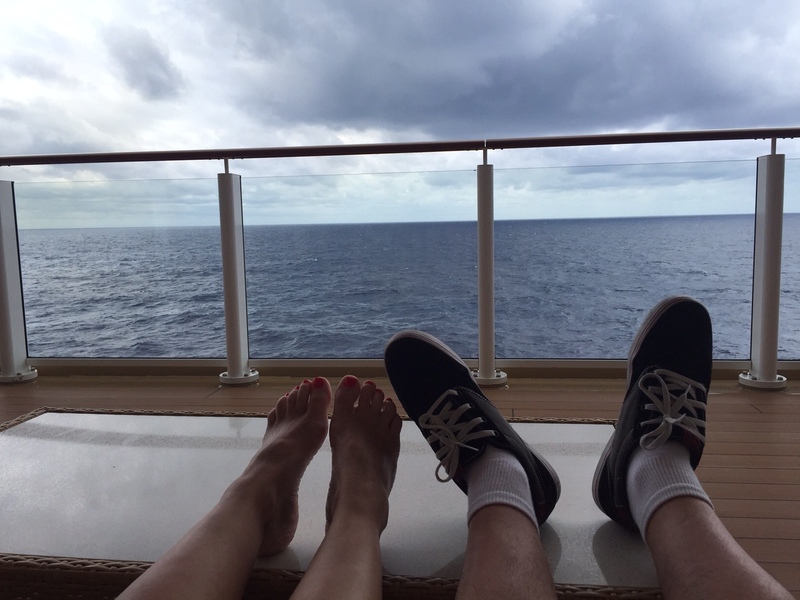 As we strolled, slowly, around the ship, we saw several people sound asleep at any hour of the day, stretched out on comfy deck furniture. It was as if we were like bike tires and someone let our air out, deflating us into heaps of relaxed blobs. I began to wonder, could it be possible that some day I’ll reach the point where I no longer have the desire and energy to be active? 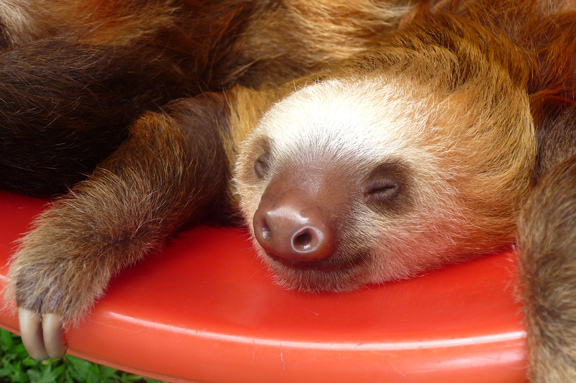 Could I become truly slothlike, or turn into what we used to call a couch-potato? This concept would have worried me if I…..cared. But for those few days, I really didn’t. I basked in the glow of downtime. Today, our first full day back home and back to reality, I took my dog for a short walk this morning, packed a salad for lunch, and went to the gym this evening for a workout. I knew it would not be easy to get through the hour of physical activity after about 10 days of not much. It has always amazed me how long it takes to get in shape, yet how quickly we can get out of it. Luckily the pre-vacation-me kicked back in and I got through the workout (albeit not at 100% capacity) and felt good. I wondered how many of my sloth-partners from last week had done the same thing today, working their way back into activity…. Or how many decided to make the lounge-mode their permanent way of life. It has taken me a lot of years to recognize the fact that sometimes, we R.W.’s need to let ourselves deflate. Sure, there is the risk of not wanting to get up and moving again, but if we are smart, we’ll find the right balance. I no longer need to be that girl who is constantly on the move, striving for 2% body fat and the strength of a small ox. I just need to be healthy. And sometimes that means slowing down. So, now, if you’ll excuse me, my recliner is calling my name. After all, it’s all about moderation, right? This entry was posted in age, Health, travel, Vacation and tagged appreciation, comfort, exercise, fitness, relaxation, slowing down, strength, summer, travel. Bookmark the permalink.